Northeastern University researchers in the field. The Ries and Grabowski Labs in the Department of Marine and Environmental Sciences at Northeastern University’s Marine Science Center (MSC) is currently seeking a graduate student interested in conducting federally-funded research on the impact of ocean acidification and warming on sea scallops, to begin summer/fall 2015. 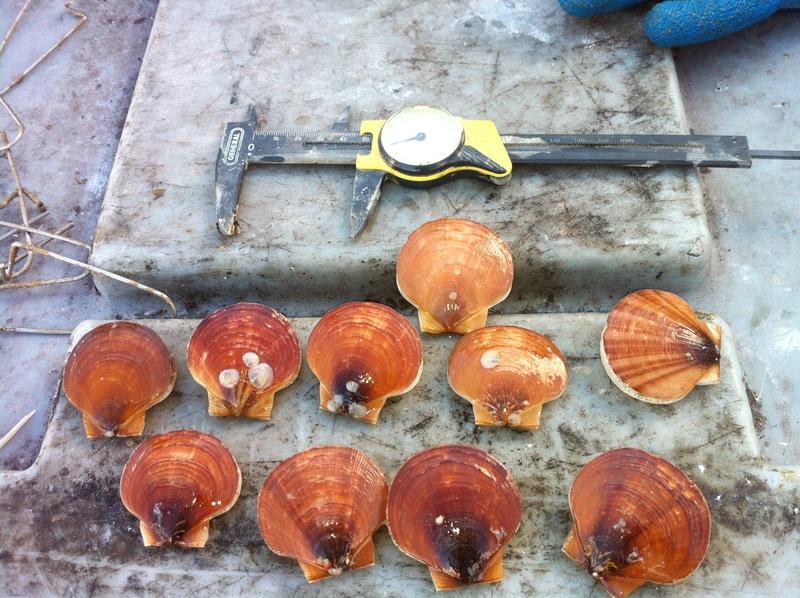 Research will include ship-board investigations of sea scallop populations on Georges Bank coupled with laboratory experiments investigating impacts of thermal and pH stress. Sea scallops are highly impacted by ocean acidification. This opportunity affords access to newly acquired state-of-the-art analytical equipment at the MSC, including a laser ablation inductively-coupled plasma mass spectrometer for trace element analysis, a powder x-ray diffractometer for mineralogical characterization, and a scanning electron microscope with energy dispersive spectrometry and electron backscatter diffraction for micro-imaging and elemental/mineralogical mapping of scallop shell ultrastructure. The selected graduate student will receive interdisciplinary training in carbonate geochemistry and biomineralization, global ocean-climate change, fisheries ecology, and ecosystem management, and will have the opportunity to develop their own PhD project under this wide umbrella while helping investigate the impacts of ocean warming and acidification on sea scallops. 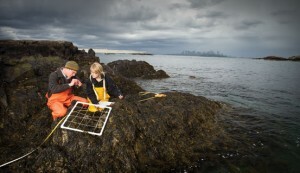 The graduate student will be based at Northeastern University’s Marine Science Center, located on the shores of Massachusetts Bay on the Nahant tombolo (13 miles north of downtown Boston). The renovated MSC features a state-of-the-art flow through seawater facility, direct access to classic New England rocky shore intertidal study sites, an in-house SCUBA program, and small-craft research vessels. Highly motivated and creative individuals with strong writing and analytical skills are encouraged to apply. Interested individuals should apply to Northeastern’s Department of Marine and Environmental Sciences’ Ph.D. program via this link. Applications are due December 15, 2014. Please direct specific inquiries to Profs. Justin Ries and Jon Grabowski. Shinnecock Inlet: Temp 54.32° F Wind 10.7 mph from the N.
Southampton: Temp 55.2° F Wind 13.0 mph from the ENE. HSC: Temp 52.4° F Wind 34.0 mph from the N.
South P: Temp 54.7° F Wind 9.0 mph from the NNW.